This tutorial will teach you how to use Open CASCADE Technology services to model a 3D object. The purpose of this tutorial is not to describe all Open CASCADE Technology classes but to help you start thinking in terms of Open CASCADE Technology as a tool. This tutorial assumes that you have experience in using and setting up C++. From a programming standpoint, Open CASCADE Technology is designed to enhance your C++ tools with 3D modeling classes, methods and functions. The combination of all these resources will allow you to create substantial applications. 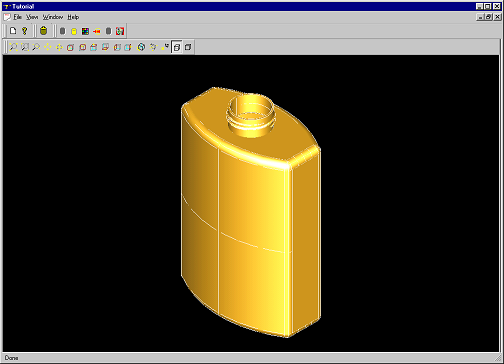 In the tutorial we will create, step-by-step, a function that will model a bottle as shown above. You will find the complete source code of this tutorial, including the very function MakeBottle in the distribution of Open CASCADE Technology. 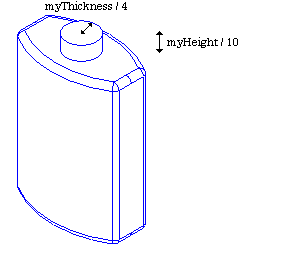 The function body is provided in the file samples/qt/Tutorial/src/MakeBottle.cxx. In addition, we decide that the bottle's profile (base) will be centered on the origin of the global Cartesian coordinate system. 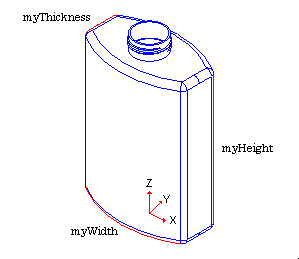 To create the bottle's profile, you first create characteristic points with their coordinates as shown below in the (XOY) plane. These points will be the supports that define the geometry of the profile. gp_Pnt is manipulated by value. Like all objects of its kind, it will have a limited lifetime. Geom_CartesianPoint is manipulated by handle and may have multiple references and a long lifetime. 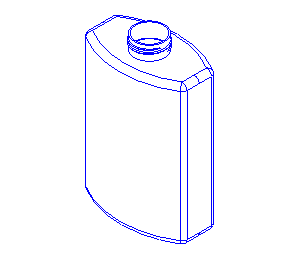 With the help of the previously defined points, you can compute a part of the bottle's profile geometry. 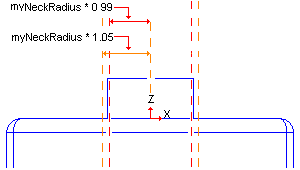 As shown in the figure below, it will consist of two segments and one arc. Class GC_MakeArcOfCircle to create an arc of a circle. A useful constructor creates an arc from two end points P1 and P3 and going through P2. Both of these classes return a Geom_TrimmedCurve manipulated by handle. This entity represents a base curve (line or circle, in our case), limited between two of its parameter values. For example, circle C is parameterized between 0 and 2PI. If you need to create a quarter of a circle, you create a Geom_TrimmedCurve on C limited between 0 and M_PI/2. Vertex TopoDS_Vertex Zero dimensional shape corresponding to a point in geometry. Edge TopoDS_Edge One-dimensional shape corresponding to a curve and bounded by a vertex at each extremity. Wire TopoDS_Wire Sequence of edges connected by vertices. Face TopoDS_Face Part of a surface bounded by a closed wire(s). Shell TopoDS_Shell Set of faces connected by edges. Solid TopoDS_Solid Part of 3D space bounded by Shells. CompSolid TopoDS_CompSolid Set of solids connected by their faces. Compound TopoDS_Compound Set of any other shapes described above. Three edges out of the previously computed curves. One wire with these edges. compute a new wire by reflecting the existing one. add the reflected wire to the initial one. X axis is located at (0, 0, 0) - use the gp_Pnt class. X axis direction is (1, 0, 0) - use the gp_Dir class. A gp_Dir instance is created out of its X, Y and Z coordinates. by using the appropriate methods corresponding to the required transformation (SetTranslation for a translation, SetMirror for a reflection, etc. ): the matrix is automatically computed. Since the simplest approach is always the best one, you should use the SetMirror method with the axis as the center of symmetry. the shape on which the transformation must be applied. What you need is a method to consider the resulting reflected shape as a wire. The TopoDS global functions provide this kind of service by casting a shape into its real type. To cast the transformed wire, use the TopoDS::Wire method. create an instance of BRepBuilderAPI_MakeWire. add all edges of the two wires by using the Add method on this object. Your current profile is a wire. Referring to the Shape/Generates table, you need to compute a face out of its wire to generate a solid. To create a face, use the BRepBuilderAPI_MakeFace class. As previously explained, a face is a part of a surface bounded by a closed wire. Generally, BRepBuilderAPI_MakeFace computes a face out of a surface and one or more wires. When the wire lies on a plane, the surface is automatically computed. a vector for a finite prism or a direction for finite and infinite prisms. Specify the shape to be filleted in the BRepFilletAPI_MakeFillet constructor. Add the fillet descriptions (an edge and a radius) using the Add method (you can add as many edges as you need). Ask for the resulting filleted shape with the Shape method. the type of sub-shapes to be found. This information is given with the TopAbs_ShapeEnum enumeration. More() to know if there are more sub-shapes to explore. Current() to know which is the currently explored sub-shape (used only if the More() method returns true). Next() to move onto the next sub-shape to explore. In the explorer loop, you have found all the edges of the bottle shape. Each one must then be added in the BRepFilletAPI_MakeFillet instance with the Add() method. Do not forget to specify the radius of the fillet along with it. Once this is done, you perform the last step of the procedure by asking for the filleted shape. 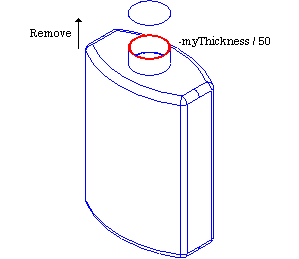 To add a neck to the bottle, you will create a cylinder and fuse it to the body. 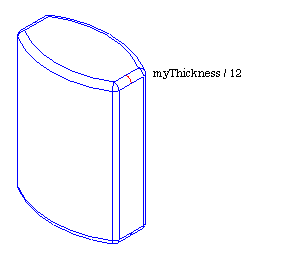 The cylinder is to be positioned on the top face of the body with a radius of myThickness / 4. and a height of myHeight / 10. Remove one or more faces from the initial solid to obtain the first wall W1 of the hollowed solid. Create a parallel wall W2 from W1 at a distance D. If D is positive, W2 will be outside the initial solid, otherwise it will be inside. Compute a solid from the two walls W1 and W2. The shape, which must be hollowed. The tolerance used for the computation (tolerance criterion for coincidence in generated shapes). The thickness between the two walls W1 and W2 (distance D). The face(s) to be removed from the original solid to compute the first wall W1. is the highest face (in Z coordinates) of the bottle. To find the face with such characteristics, you will once again use an explorer to iterate on all the bottle's faces to find the appropriate one. Point to access the 3D point of a vertex. You have now found the top face of the neck. Your final step before creating the hollowed solid is to put this face in a list. Since more than one face can be removed from the initial solid, the BRepOffsetAPI_MakeThickSolid constructor takes a list of faces as arguments. Open CASCADE Technology provides many collections for different kinds of objects: see TColGeom package for collections of objects from Geom package, TColgp package for collections of objects from gp package, etc. The collection for shapes can be found in the TopTools package. As BRepOffsetAPI_MakeThickSolid requires a list, use the TopTools_ListOfShape class. Notice that one of the cylindrical surfaces is smaller than the neck. There is a good reason for this: after the thread creation, you will fuse it with the neck. So, we must make sure that the two shapes remain in contact. 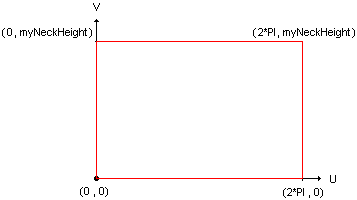 P is the point defined by parameters (U, V). O, *Dir, yDir and zDir are respectively the origin, the X direction, Y direction and Z direction of the cylindrical surface local coordinate system. R is the radius of the cylindrical surface. U range is [0, 2PI] and V is infinite. the derivative vectors of order 1, 2 to N at this point. A center located in the middle of the neck's cylinder parametric space at (2*PI, myNeckHeight / 2) in U, V coordinates. A X direction defined with the (2*PI, myNeckHeight/4) vector in U, V coordinates, so that the curves occupy half of the neck's surfaces. To define a 2D point from its X and Y coordinates, use the gp_Pnt2d class. To define a 2D direction (unit vector) from its X and Y coordinates, use the gp_Dir2d class. The coordinates will automatically be normalized. To define a 2D right-handed coordinate system, use the gp_Ax2d class, which is computed from a point (origin of the coordinate system) and a direction - the X direction of the coordinate system. The Y direction will be automatically computed. You will now define the curves. 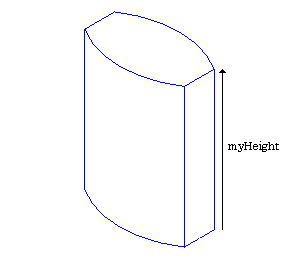 As previously mentioned, these thread profiles are computed on two cylindrical surfaces. In the following figure, curves on the left define the base (on aCyl1 surface) and the curves on the right define the top of the thread's shape (on aCyl2 surface). a minor radius on the minor axis defined by the Y direction of the coordinate system. To describe portions of curves for the arcs drawn above, you define Geom2d_TrimmedCurve trimmed curves out of the created ellipses and two parameters to limit them. As the parametric equation of an ellipse is P(U) = O + (MajorRadius * cos(U) * XDirection) + (MinorRadius * sin(U) * YDirection), the ellipses need to be limited between 0 and M_PI. The last step consists in defining the segment, which is the same for the two profiles: a line limited by the first and the last point of one of the arcs. To access the point corresponding to the parameter of a curve or a surface, you use the Value or D0 method (meaning 0th derivative), D1 method is for first derivative, D2 for the second one. compute the edges of the neck's threading. compute two wires out of these edges. To compute the edges out of these curves, once again use the BRepBuilderAPI_MakeEdge class. One of its constructors allows you to build an edge out of a curve described in the 2D parametric space of a surface. Now, you can create the two profiles of the threading, lying on each surface. Remember that these wires were built out of a surface and 2D curves. One important data item is missing as far as these wires are concerned: there is no information on the 3D curves. Fortunately, you do not need to compute this yourself, which can be a difficult task since the mathematics can be quite complex. When a shape contains all the necessary information except 3D curves, Open CASCADE Technology provides a tool to build them automatically. In the BRepLib tool package, you can use the BuildCurves3d method to compute 3D curves for all the edges of a shape. Initialize the algorithm by creating an instance of the class. The first parameter of this constructor must be specified if you want to create a solid. By default, BRepOffsetAPI_ThruSections builds a shell. Add the successive wires using the AddWire method. Use the CheckCompatibility method to activate (or deactivate) the option that checks whether the wires have the same number of edges. In this case, wires have two edges each, so you can deactivate this option. Ask for the resulting loft shape with the Shape method. We hope that this tutorial has provided you with a feel for the industrial strength power of Open CASCADE Technology. If you want to know more and develop major projects using Open CASCADE Technology, we invite you to study our training, support, and consulting services on our site at http://www.opencascade.com/content/technology-support. Our professional services can maximize the power of your Open CASCADE Technology applications.